Thanks to its neutral finish and timeless look, the sleek lines of this armoire blend perfectly into today's trendiest décors. 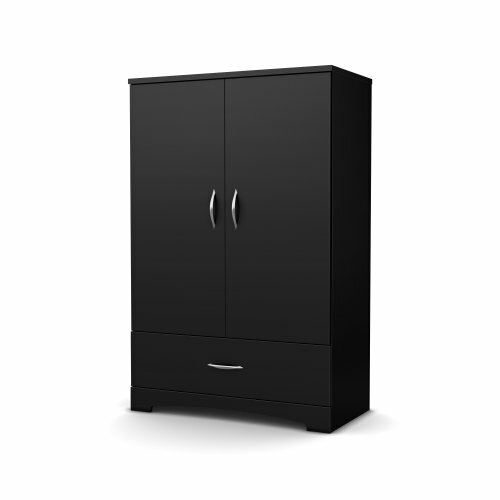 Featuring 2 adjustable shelves behind each door, and a large drawer for storage, it is a very convenient storage addition to any bedroom furniture ensemble. This collection was designed just for tighter spaces! The furniture lets you picture a simple décor that's brought to life through the use of bright colors. Let your imagination go wild, and see where it takes you! Elegant metal handles in a Brushed Nickel finish. Features 3 storage compartments behind the doors separated by 2 adjustable shelves that can support a weight up to 15 pounds each. Features 1 spacious drawer. Includes 2 hooks for hanging scarves, ties or other items. Metal drawer slides. Drawer dimensions #1: 29.5'' (L) x 13.625'' (D) x 4.375'' (H). Shelf #1 dimensions: 31.5'' (L) x 17.375'' (D). Shelf #2 dimensions: 31.5'' (L) x 14.625'' (D). Accessories not included. Requires complete assembly by 2 adults (tools not included). 32.875'' (W) x 18.875'' (D) x 55.125'' (H). Box dimensions: 71.77'' (L) x 19.56'' (W) x 6.5'' (H), 127 lb. Ships in a heavy box, make sure to have a friend with you. Packaging tested and certified to reduce the risk of damage during shipment. Made in North America with non-toxic laminated particleboard. 5-year quality guarantee. Any questions? Contact South Shore, the manufacturer, available 7/7 by phone, email or chat.